A team of authors has produced a finely researched study of the Maginot line. The level of illustration is excellent and this must be the definitive guide to the history and locations of one of the greatest fixed fortifications ever constructed, a fascinating story – Most Highly Recommended. story – Most Highly Recommended. fortifications were to be used as their builders had envisaged. France and which held the potential to save millions of French lives. developed in Germany, but no one of importance took them seriously. and equipped with modern armour in volume. solid French defence line would leave Belgium to German occupation. country. The result was to ensure a French defeat. these only demonstrated the technical quality of the fortification. that were attempting to fight behind the Maginot Line. 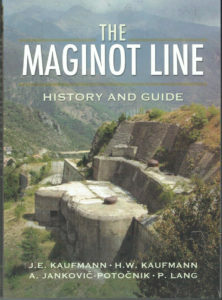 that the Maginot Line was designed with the aircraft of WWI in mind. breaches necessary to pass through the Line.